See Rob being interviewed by University of Pennsylvania professor Jonathan Supovitz on how teachers experience change. Click here to view. Rob Evans spoke to parents at the Randolph School in Huntsville, AL, in August 2012 about resilience. 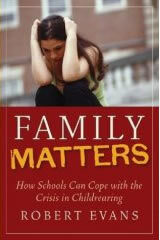 He described the challenges of 21st century parenting and outlined three key factors that foster resilience in children. See video excerpts from this talk. Rob Evans provides a range of consulting and training services including professional development programs, organizational consulting services, and parent education programs. These are available for audiences of all sizes in a variety of formats. As life in schools grows steadily more complex, the pressure of rising demands affects the morale and performance of teachers and leaders alike, even in strong schools. The need to rekindle commitment and renew skills has never been greater. Rob does not advocate a particular set of school changes or exhort audiences to embrace change. He concentrates on the real problems real people and real organizations face when they want to changeor are pressed to do so. His programs focus on the needs of faculty and leaders as they try to meet the needs of students. He works with large groups for long periods of time and keeps them engaged and involved. He is happy to tailor presentations and consultations to specific local needs.